Wow, it's been 6 years since I last posted a General Vamp's recipe attempt. I actually tried this last May but didn't have a chance to post it. And then I forgot about it until now. Why such a long gap between attempts? Because I couldn't find anywhere local that carried chicken cutlets. 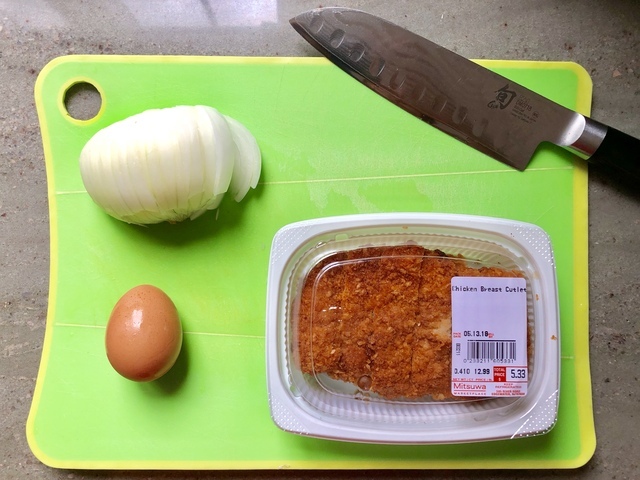 For the longest time I could only find pork cutlets at Mitsuwa but I would always keep an eye out for chicken. So imagine my surprise when after so many years I finally saw chicken cutlets available. Preparation as usual wasn't particularly hard. 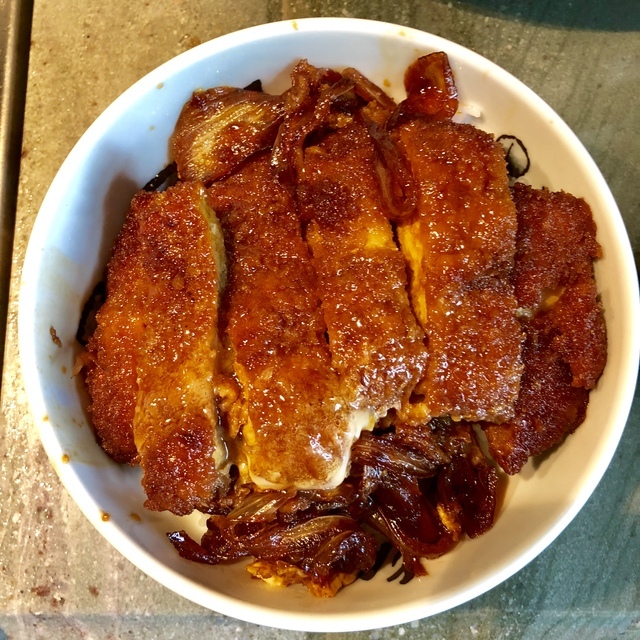 But unfortunately I wound up using too much sukiyaki sauce and not enough water so the completed dish wound up being too salty for my tastes. As you can tell from the photo below it just looks too salty. Next time I'll actually taste test it first before I dish it out onto the rice. And possibly throw on some chopped green onions on top. So it's been about 7 months since Apple Airpods have been available in limited quantities and the online store still shows a wait time of at least 6 weeks if you order them now. Luckily, while visiting a retail location a few weeks back with a cousin to pick up an iPod Shuffle, I figured I'd ask to see if they happened to have any available and lo and behold, they did! So I picked one up to see how well it works and if it'd be good enough to keep around. 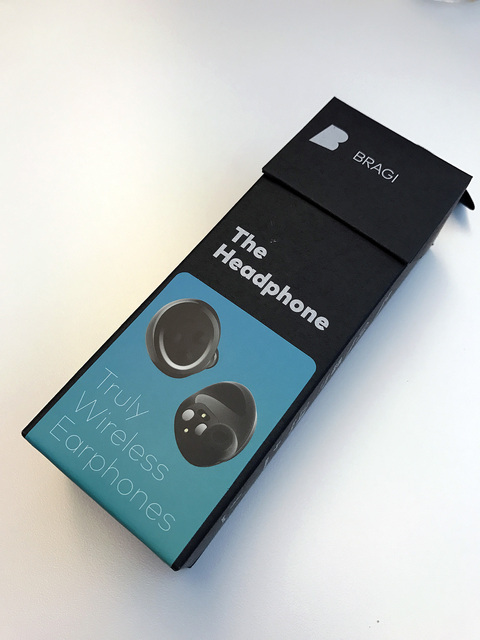 So a few months after my previous wireless earbud showdown, I came across the Bragi Headphone and just had to try it out. At $150, it was significantly cheaper than the previous three that I had tested. Unfortunately, you do get what you pay for in this case. 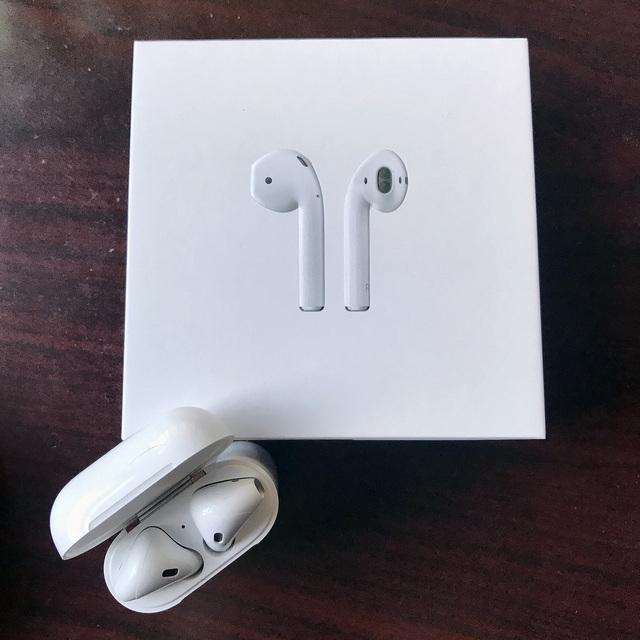 After wandering around Best Buy during the current holiday season, I was surprised to see a burgeoning selection of true wireless earbuds actually available for sale in store. "True wireless" meaning that they're just two earbuds with nothing connecting them. First to market contenders already existed since a year ago: the Earin and Bragi Dash and the like but I figured the first ones of this product type would most likely not be very good and subsequent reviews pretty much affirmed that view. But the brightly packaged and slick-looking Skybuds attracted my attention so I decided to give them a shot. 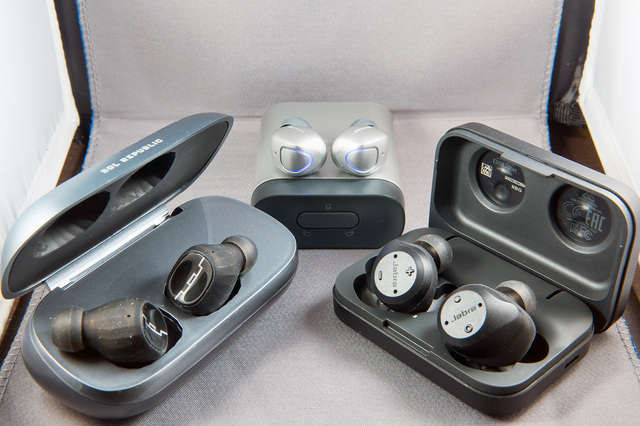 I subsequently also tested out the Sol Republic Amps Air and Jabra Elite Sport True Wireless Earbuds as well to try to get a better idea on what the audio quality of these latest Bluetooth earbuds were like. For the past couple of years, my workhorse commute in-ear headphone was the Sony XBA-3iP, packing 3 balanced armature drivers and a built-in, full-suite (playback & volume controls) smartphone controller/mic. The reason I liked it was because it was one of the few, if possibly the only, 3-driver in-ear at the time that had a relatively small casing and didn't require being worn w/the cable looped up and around the ear. I absolutely HATE wearing headphones that way mainly cause the cables never stay in place for me. It was a pretty good pair of in-ears, not the absolute best reviews, but good enough for me. Unfortunately early last year the volume control broke. But since everything else about it was still good I continued to use them, until towards the end of the year when I finally started thinking about finding a replacement. But I liked the Puro well enough to switch to it as my main in-ears. After awhile though, GAS (Gear Acquisition Syndrome) started nipping at my heels so I started looking for yet another replacement, this time with volume controls. And so I ended up with the Sennheiser Momentum In-Ear. While this had all the functionality I wanted, I wasn't completely sold on the sound signature. So back to browsing on Amazon again for another pair that had a sound more in tune with what I like. And that's how I came across the 1MORE Triple Driver In-Ear Headphones with In-line Microphone and Remote. I had never heard of 1MORE before but the reviews on Amazon were really good and the price was insane for a triple-driver. At about the same time, Grado apparently decided they needed some of my money as well and released their new iGe. They were priced the same so I figured I'd do a comparison to see how they would fare against each other. 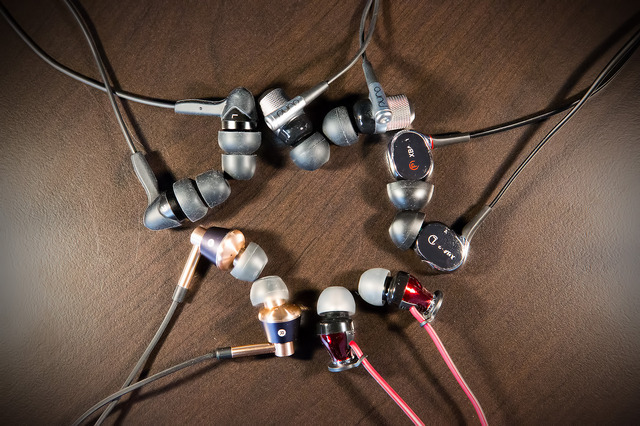 So that's what this post is ultimately about, a 4-way in-ear headphone comparison. Before I get started, I would just like to make clear that I am in no way a full-fledged audiophile. I don't inspect every detail of headphone specs or look at/compare measurement charts or whatnot. I don't even know what much of the specs even mean. I just plug in the headphones, crank up some tunes, close my eyes, and listen. I can distinguish between highs, mids and lows and possibly make out differences in soundstage if I concentrate hard enough. But I can't wax poetic about the quality of each sound range. As for how I tested, since I use these primarily during my work commute, I just plugged them straight into my iPhone 6S. No amp. I'll also comment a little about the physical aspects of each pair of headphones. So, with that out of the way, here goes nothing. For the past year or so, I had been slowly becoming increasingly dissatisfied with the pixel density of computer monitors that I've been using for the past few years. 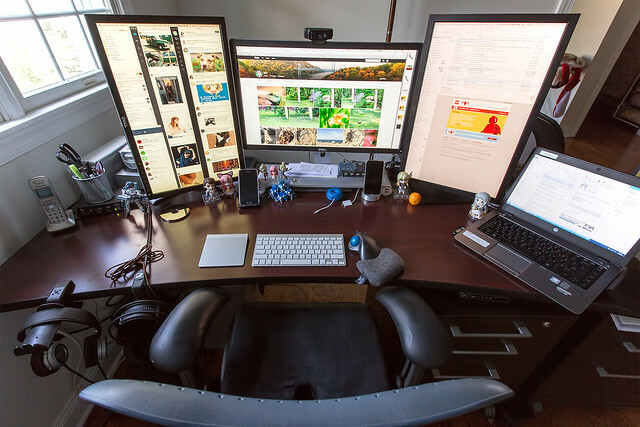 As can be seen from last year's desk photo, I've accumulated three 24" displays over the years: an Apple Cinema Display flanked by two Dells. But after being spoiled by the high PPI displays on the cell phones and tablets of today, the low pixel density of the displays from yesteryear were starting to grate on my eyes. In anticipation of a family outing to a Great Wolf indoor water park, I once again began pondering what to use for photos in an aquatic environment. In the past I had tried out waterproof compact cameras from Nikon and Olympus and found them lacking. Furthermore, we don't visit water parks often enough to justify putting down the $$$ for a camera that would see use at most once every few years. And they would find little use in a non-aquatic environment too since my phone has pretty much picked up all the photo duties that a compact had at one point years ago. One time I tried to make do with my iPhone in a "waterproof" zip bag. Which turned out not to be so waterproof so you could imagine what happened then. 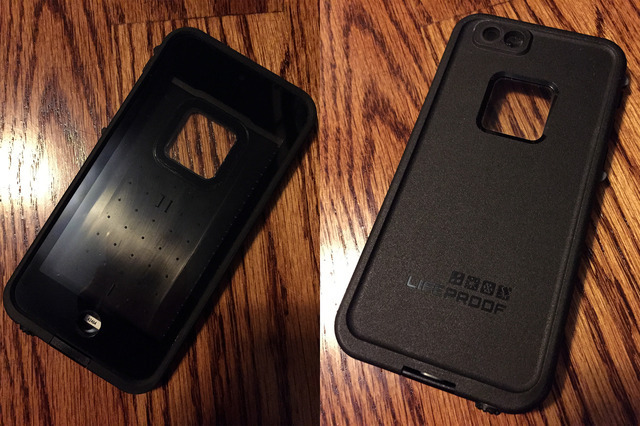 I had also tried out a LifeProof nüüd case with my iPhone 5 and unfortunately I don't recall at all how useful it was in action. At least I didn't wind up with a drowned iPhone. That, I would have remembered. Again, not something we use too often. After last week's simple udon recipe, this week's recipe #4 is even easier, requiring just a toaster. 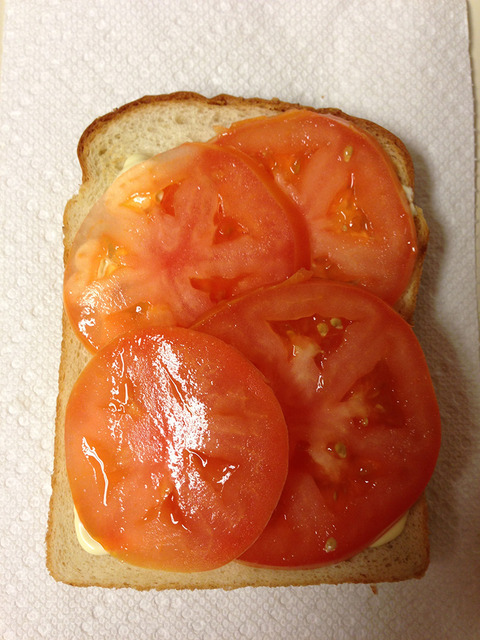 Not too tough to toast a piece of bread, slather it with mayo and layer a couple of slices of tomato on top. I did it w/a slice of tofu bread and Kewpie lite. 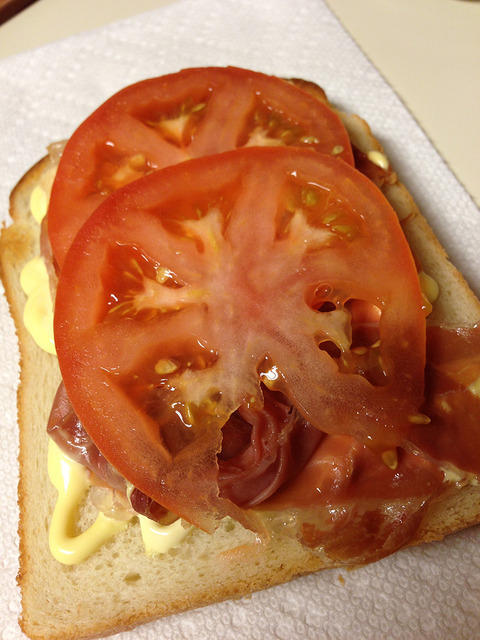 The mayo and tomato makes a nice combo and I like the taste but as with last week's recipe, not particularly filling. So for my second slice I added a couple of slices of prosciutto that I had lying around in the fridge. Could also make do with ham (or any other sliced meat of choice). Prosciutto may be wasted on this particular recipe though since the mayo tends to dominate the distinctive prosciutto taste. Anyway, final score for the original recipe: 6 out of 10. "This weblog is licensed under a Creative Commons License.